The heat got to runners Lim Nghee Huat and Yong Yuen Cheng on the fifth day of their quest to run 50km daily for 50 days in a row, as they deviated from their planned route for a cooler one instead. Mr Lim, 61, an editor, and Mr Yong, 43, a teacher, are running to celebrate Singapore's 50th birthday and pay tribute to the resilience of the nation's pioneers. They have completed 250km over five days, including 50km through Upper Peirce Reservoir yesterday, which they finished in 7 hours and 30 minutes. "It was an easy run - hilly but cool," said Mr Lim. "There were lots of trees and shade." Starting at 7am instead of 8am yesterday, they were accompanied by ultramarathoner Gerrard Lin, 31, and Institute of Technical Education (ITE) physical education teacher Chen Joo Soon, 56. At the 35km mark, Mr Chen struggled to go on as his feet were numb. "But I saw Mr Lim ahead of me, if he can do it, why can't I?" he said. Yesterday, the organising committee had planned to run a route starting at MacRitchie Reservoir and running through Choa Chu Kang and Jurong, but changed plans due to the heat. For Mr Yong, routes winding through busy urban areas meant more stoppages at traffic lights. Yesterday's run through Upper Peirce Reservoir was challenging in that it was hilly. "Each route has its pros and cons," he said. The duo are running seven different islandwide routes planned by youth charity Heartware Network and ITE volunteers, with help from Mr Yong. Organisers will tweak the routes to suit the runners' conditions, as safety comes first. Last Saturday, Mr Lim sustained a minor knee injury after he tripped and fell on a roadside kerb. He said: "Judging by our progress so far, we should be able to complete 50km for 50 days - provided the weather is kind and we stay injury-free." 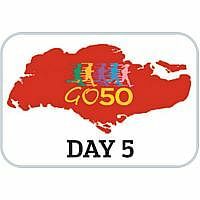 Click here to read more stories about the Go50 Run and get regular updates on the runners' progress since Day 1.